Are you interested in fighting games, but don’t have the time or dexterity to compete at the highest levels? Or do you simply want to dive deep into the genre’s characteristic strategy and mind games without worrying about executing perfect combos and special moves? 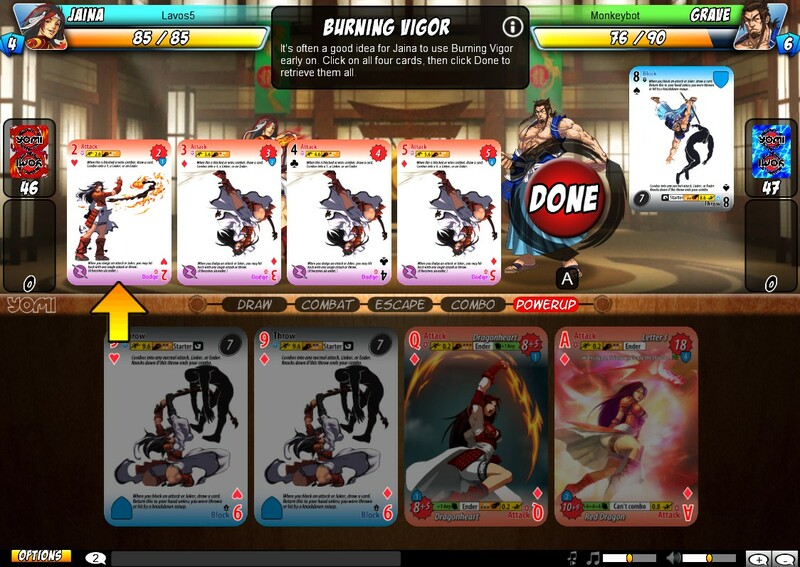 If so, you might be interested in a card game called Yomi, from Sirlin Games. Designed by a competitive Street Fighter veteran, the game simulates a one-on-one martial arts duel between two colorful characters. Now, Steam users have the opportunity to join the fight — but is it worth the price of admission? 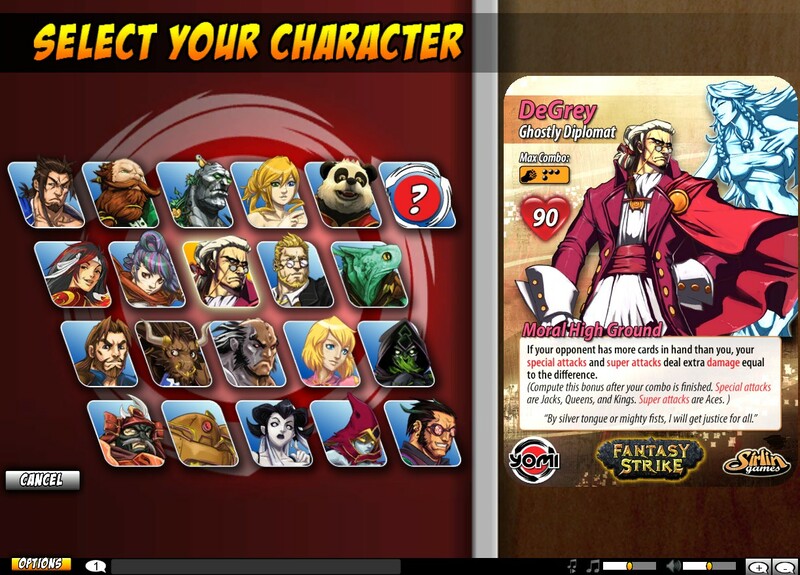 In line with its “fighting card game” motif, a game of Yomi begins with both players selecting one of 10 characters (or 20 if you buy the DLC expansion). Each character has a distinct deck of cards, and their own unique special ability which allows them to bend the rules of the game. 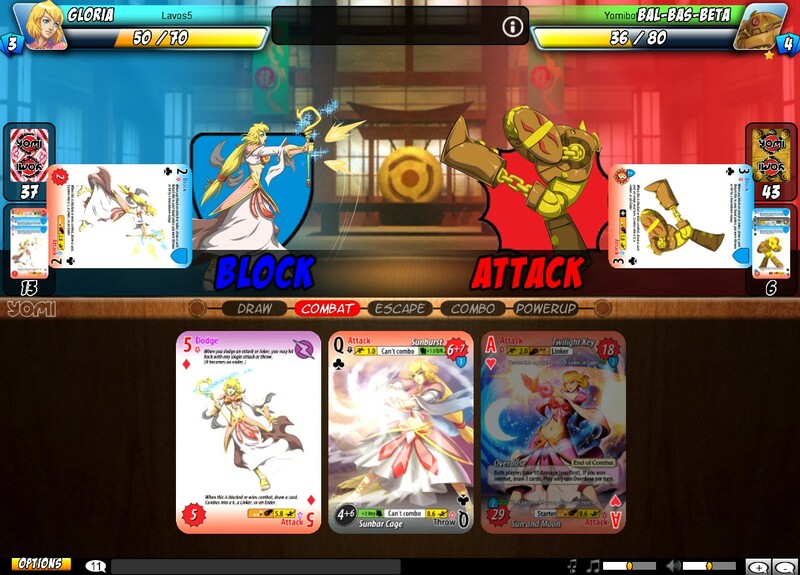 After the characters are set, each player draws seven cards from their personal deck, and the fight begins. Cards in Yomi are standard playing cards from a 52-card deck (plus two jokers), except that each end has a fighting game move printed on it. A “normal” card (rank 2-10) might be adorned with “Attack” on one end and “Dodge” on the other. Face cards have powerful “special” moves (think Hadouken or Shoryuken), and Aces are home to a character’s devastating Super technique. The standard deck composition means you can use your natural intuition to know your chances of getting certain cards, and the two-options-per-card mechanic means you’re less likely to get screwed with an awful hand right off the bat. Each round, both players simultaneously play one card from their hand face-down. Then the cards are flipped face-up, and the winner of the round is determined by a simple Virtua Fighter-esque rock-paper-scissors system: attacks interrupt throws, throws ignore blocks/dodges, and blocks/dodges stop attacks. What makes this more interesting than just rock-paper-scissors is that the payoff varies depending on the specific card you played. 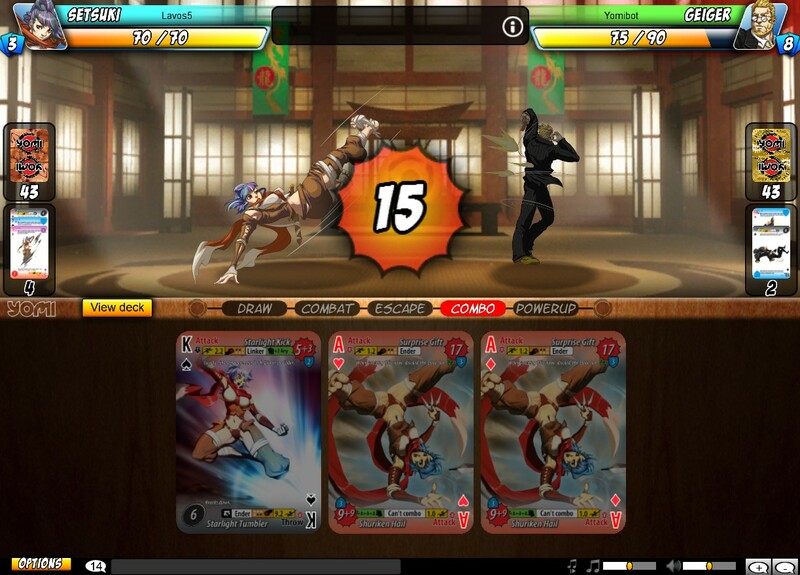 Land an attack, and you can chain more attacks from your hand to create an unavoidable combo, dealing heavy damage. Successfully execute a throw, and you have the option of following up with a combo or knocking down your opponent, limiting their options in the next round. Dodging an attack lets you hit back with a single unavoidable attack or throw, and blocking an attack lets you draw an extra card. These different payoffs have a subtle but very interesting effect. The game’s title comes from the Japanese word for “reading,” as in “reading your opponent’s mind.” Thus, a huge part of the game is guessing which type of card your opponent will play next, based on their past tendencies and their current situation. For example, if your opponent only has two or three cards in hand, they’re likely to try blocking this turn, because a successful block means you get to draw more cards. Knowing this, you might want to play a throw to break through their guard. However, your opponent also knows you know this, and might anticipate your throw by attacking. These kinds of mindgames exist at the high levels of every competitive fighting game, and they’re represented beautifully in Yomi. Hand management is also important – you have to be careful about which cards you play, because otherwise you might end up without any copies of a particular action (having a small hand with no blocks is not fun). Also, if you just slap down cards willy-nilly, you’re unlikely to draw cards that combo into each other, limiting your damage output. On top of that, optimal hand management is different for each of the 20 characters; they each have different decks, after all. This all adds up to a very deep game with a lot to learn. Even if you mainly use only one or two characters, learning the ins and outs of all of them is beneficial because it’ll help you predict your opponent’s actions. And there are plenty of opportunities to build this knowledge. Beyond simple 1v1 online matchmaking, you have a well-written tutorial, two levels of bots to practice against offline, and a survival mode that challenges you to fight an infinite stream of increasingly-difficult opponents with only limited healing between bouts. Playing the game will unlock fun bonuses like gold-foil card variants, cards that remember stats about their use, and super-powered “EX” characters for offline play. None of these give you any advantage in the online arena, however – the playing field is kept totally even at all times (assuming both players own the DLC characters). Unfortunately, as of this writing, the online player base is pretty small, and you won’t be able to find a match at all hours of the day. This means you’ll often have no choice but to play against the bots, which is fine, but definitely not as fun as playing against human opponents. As for the client and interface, it’s solid and gets the job done. It looks and feels a lot like the web client, but a lot more stable and quick to load. The card art is high-res and looks just as lovely as the physical cards do. An advantage of playing the digital version is that the text on the cards will rotate along with the cards themselves, so that you never have to read upside-down text. The simple animations that play during combos are fun, and minor touches (like the cards wiggling as you mouse over them) make it easy to quickly grab cards out of your hand or discard pile. The background music is simple and forgettable, but provides decent atmosphere during fights. My only criticisms of the interface are that everything is a bit too big when playing in fullscreen, and I’d like an intermediate chat-size setting between the second (small sidebar) and third (fullscreen) settings. Honestly, the best part of Yomi’s Steam release is that there’s finally a convenient way to play against bots without the web client. The price is identical to the web version: $14.99 for 10 base characters, then another $14.99 for the 10 DLC characters. By getting it on Steam, however, you’re getting better performance, higher-resolution cards, better stat-tracking, and Steam friends list integration. The price might seem like a big ask for such a seemingly simple game, and that might be true depending on what you’re looking for. It’s content-lean by video game standards, but said content is so tightly designed that, if it gets its hooks in you, it’ll stand up to replay after replay for months. As a casual player of the physical version, I can attest to this personally. I strongly recommend Yomi to people who like asymmetric multiplayer games or designer card games, and also people who like fighting games but aren’t a fan of difficult execution requirements. (I’m in all three camps.) In any case, the web client is free-to-play, so you can go through the tutorial and try a couple practice rounds before dropping the cash for the much nicer Steam release. Maybe I’ll see you in the arena!